In the 1870s a five-block stretch of Fulton Avenue in the Inner Richmond District, across from Golden Gate Park, was known as Beer Town. The dozens of saloons, along what was then called D Street, serviced the patrons of the adjacent Bay District Race Track. One of the most popular 'resorts' in Beer Town was Colonel Dickey's Road House which was famous for serving mint juleps and gin fizzes any time of day or night. Beer Town and the racetrack was serviced by the Geary Street, Park and Ocean Railroad which ran down D Street. In 1894 the fortunes of Beer Town was raised by the Midwinter Exposition held in Golden Gate Park. Soon demand for drinking establishments grew and by the middle of that year, Seventh Street alone had seven saloons side-by-side in one half-block. When the Exposition closed and the racetrack folded, Beer Town didn't miss a beat. The old racetrack was converted to an Army base, Camp Merritt holding 7,000 soldiers. The number of saloons swelled to 44 and were accompanied by a number of brothels. Camp Merritt closed in 1898 and still Beer Town thrived due to the popular nearby amusement park, the Chutes. Even the earthquake of 1906 and an angry neighborhood improvement committee failed to shut down the saloons and the brothels. What eventually caused the demise of Beer Town was an extended rail strike and the closing of the Chutes. By 1910 only five saloons remained and the surrounding Richmond District was fast being converted into a residential area. The final drinking establishment, the Jockey Club was torn down in 1914. 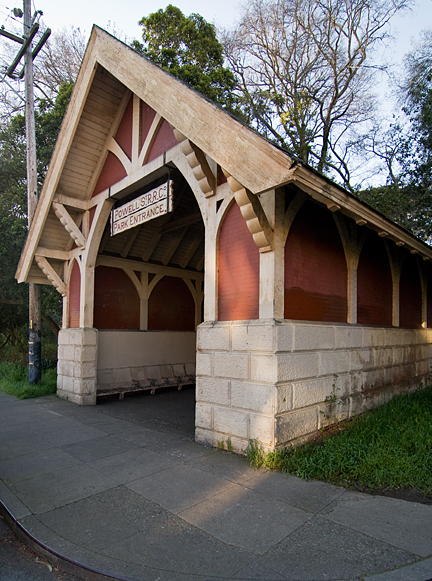 Today, the only remnant of Beer Town is this train waiting shelter located at Futon and Seventh Street on the edge of Golden Gate Park.